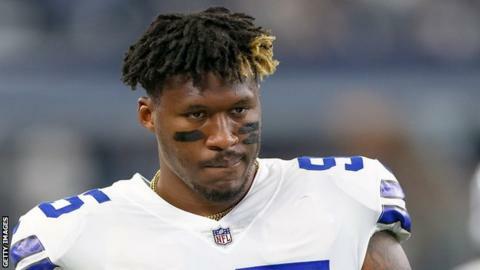 Dallas Cowboys defensive lineman David Irving announced he is quitting the NFL during a live Instagram stream, while appearing to be smoking marijuana. Irving, 25, was recently suspended indefinitely by the NFL for a third violation of its drugs policy. "Basically, guys, I quit," Irving said. "I don't want to talk about a suspension and all this other nonsense. "I'm outta there. You know, there's a lot of reasons why I come to this decision." Irving has spent the past four seasons with the Cowboys since joining as an undrafted free agent out of Iowa State. Part of his grievance with the NFL appears to be that he would rather it allow players to self-medicate with marijuana than be given other forms of painkillers and drugs. "As you know I've voiced my opinion about this medicine right here," he said, holding up what appeared to be a joint. "We got this opioid thing going on. Everyone thinks it's about smoking weed, it's not. It's much bigger than that. "I have concussions every day. I feel it, crashing cars and all types of stuff." "If I'm going be addicted to something, I'd rather be addicted to marijuana, which is medical - it's a medicine, I do not consider it a drug - rather than Xanax bars or the [hydrocodone] or the Seroquel that they feed you." Xanax bars and Seroquel are treatments for mental issues, while hydrocodone is a painkiller. He added: "Everyone questions my commitment to football, but let's get it straight, here and now. I love football. "I wouldn't be here without it. Don't get me wrong, I love football. "However, I don't love the NFL. The NFL is not football - you need to understand that."